1-7 weekdays, 11-4 weekends. Preview 6-9 Thurs 28th August. Creative Transit presents Chinese Whispers, an ambitious and exciting group exhibition of 20 contemporary artists based in the North-West. Please join us on Thursday 25 August, from 6-9 p.m. at BLANKSPACE, for the Exhibition Preview evening and to meet the artists involved. 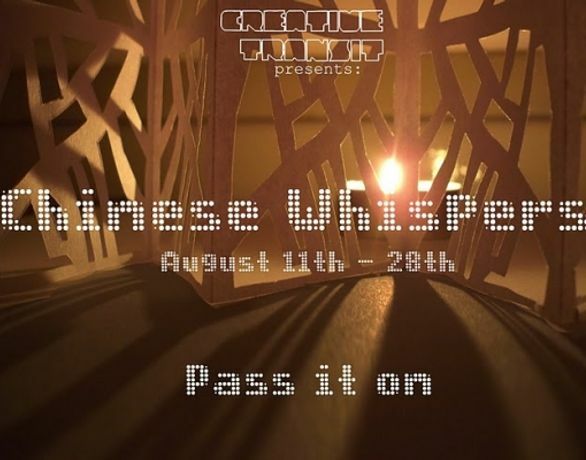 Chinese Whispers is an experimental exhibition exploring the concept of it's childhood game namesake. The artists involved have taken an element from a colleague's work and responded to it in their own unique style. When displayed in sequence, these works create a narrative running through the gallery. The viewer is required to take on the role of attentive listener, to discover the links within the work, adding their own interpretations, and uncovering the hidden narrative within the web of âwhispers'.